Today I’m sharing a copycat version of one of my favorite restaurant meals EVER, the Dragon Bowl #28 from Brown’s. I’ve always loved Brown’s and although we don’t eat out often, it’s the place I usually suggest. The food is great, the atmosphere is fun and the drinks are amazing. They also have fantastic brunch and a Mimosa special on weekends that I tend to take advantage of whenever I can. Whoops. 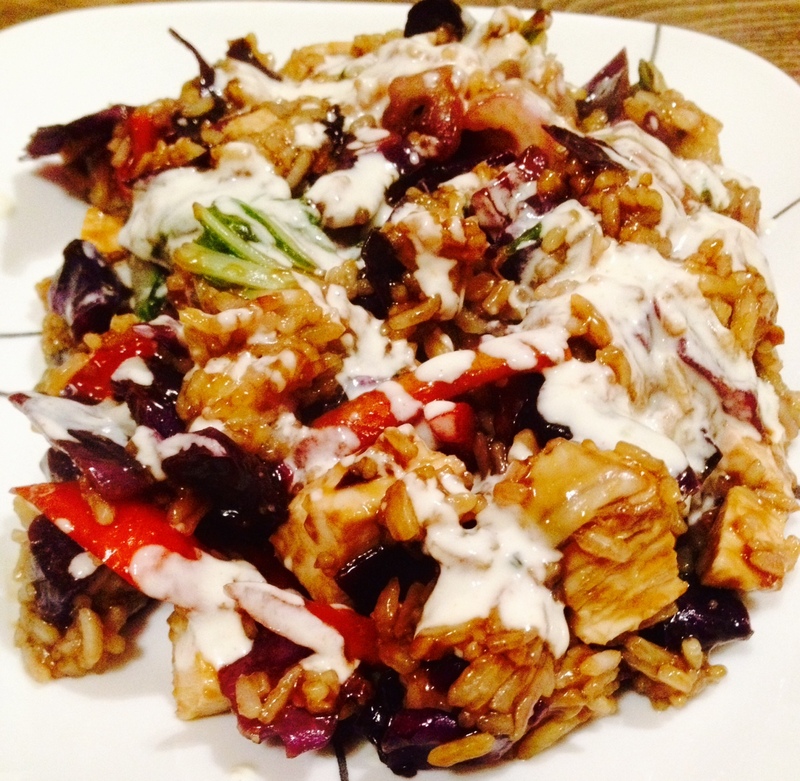 A really popular item on their menu is the Dragon Bowl, a chicken teriyaki stir-fry with rice and vegetables, drizzled with a spicy yogurt sauce. Every time I went to Brown’s, at least one person ordered it and it looked so good that one time I cracked and now I never get anything else when I go there. It actually took me a long time to try, because I figured stir-fry was stir-fry and it was easy enough to make at home. Not so with the Dragon Bowl. Something about this combo is a total flavor explosion and I can’t get enough of it. Put your rice on to cook according to package directions, substituting stock and coconut milk for water and stirring in the ranch powder. While the rice cooks, stir together your Spicy Yogurt Sauce ingredients. Set aside. To make the teriyaki sauce, add all of the ingredients except the cornstarch and cold water in a small saucepan over medium heat, cooking for a minute or so. Stir together the cornstarch and cold water to make a slurry and add to the pot. Continue stirring over the heat until the sauce thickens and becomes glossy. Once thickened to your liking, remove from heat and set aside. Heat 1 tbsp. oil in a very large wok over medium-high heat. Heat the chicken until cooked through. Add the diced veggies and stir fry for a few minutes, until veggies are tender-crisp. 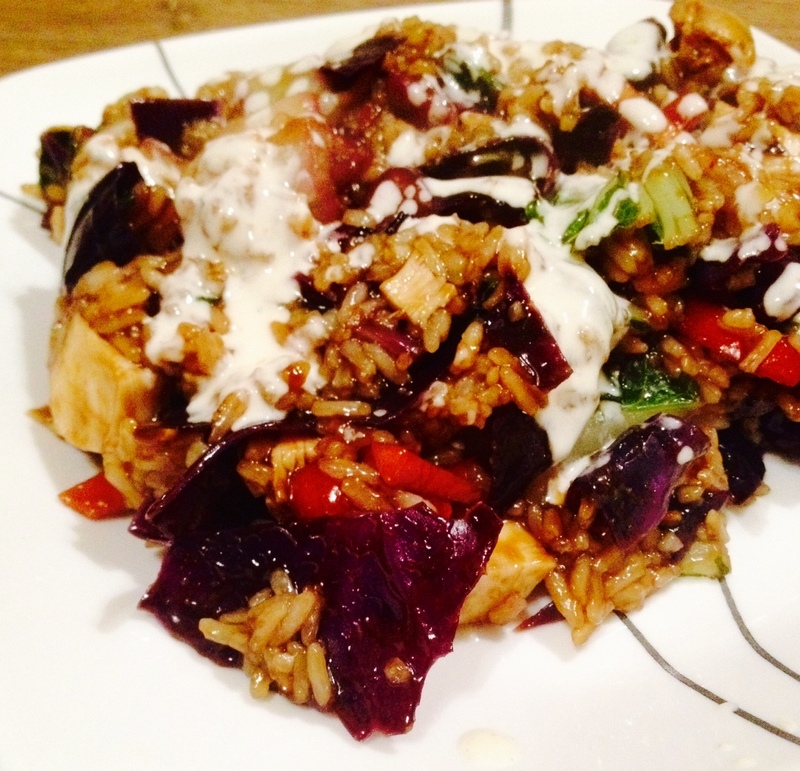 To assemble the bowls, stir together the cooked rice, chicken, veggies and teriyaki sauce. Taste and season with extra ranch seasoning if desired. Drizzle with Spicy Yogurt Sauce and serve! I found Dan’s Ranch Seasoning at Sobey’s but I have also seen it at Co-op. If you really want to save on prep time, you can use pre-shredded coleslaw mix. Cook the rice in coconut milk to make coconut rice like Browns uses. Thanks for the tip! I bet that would take it over the top. They say it’s “Almond Rice” on the recipe. I’m going to try cooking mine in almond milk. Just tried this at Browns last week and have been craving it ever since!!! Ah good idea! Let me know how it goes. It’s actually Dan’s ranch powder that is mixed in with yogurt that gives it the salty spice. My client was a manager there. They put it in everything. Awesome! Thanks for the tip. I wonder where one can buy that? This looks wonderful! Have you ever had the bacon and tomato soup at State & Main? I would love to try to make it at home…. I braise the red cabbage separately with butter and apple cider vinegar before throwing that in the bowl. Gives it that nice tangy zing! Where do you purchase Dan’s ranch dressing? And is it called Uncle Dan’s? Yes it is! I’ve gotten it at Coop and Sobey’s. Had friends over for dinner last night and made this. Just layered mine with coconut rice first, then the sauce, then the chicken and veggies topped with some pickled red cabbage and green onion. It was amazing and a big hit with our friends so, a BIG thank you for the recipe. PS I got my Dan’s Ranch Dressing from Co-op. Awesome Lorraine, I’m so glad you guys enjoyed it! I was at Browns and noticed a couple things in the dish that I then tried at home, and it was amazing! I used prepared red cabbage. you can buy it in a jar and it’s kind of pickled. I added 1 Tbsp of mayo to the yogurt and also some chili garlic sauce (it is spicey at the restaurant!) They have what I believe is little fried pieces of either wonton wrapper or panko breading on top of the veggies. I tried crushed up pieces of wonton wrappers (fired) sooooo good! I was so excited to make this, but it didn’t taste like Browns’ at all. The teriyaki sauce was also far too sweet. Sorry you didn’t enjoy! Did you follow the recipe/ingredients exactly? What about the pickled cabbage and crunchy bits? I’ve never really found a pickled cabbage recipe that I’ve loved for this so I just leave it off. If you have one, please share! I just had the Dragon Bowl today…love it too. I noticed that your recipe doesn’t include onions and the Dragon Bowl has onions I’m pretty sure. It also seemed to have maybe crunchy onion bits which makes me think that’s what the bits are? Any thoughts on including onions as part of the veggie? Thank you for posting this, can’t wait to try it.